Just Before I Go, previously entitled Hello I Must Be Going, is a 2014 black comedy drama film directed by Courteney Cox, in her second directorial effort (following her debut with the Lifetime original film TalhotBlond), from a screenplay written by David Flebotte, starring Seann William Scott, Elisha Cuthbert, Olivia Thirlby, Garret Dillahunt, and Kate Walsh. The film premiered at the Tribeca Film Festival on April 24, 2014, and it was released in select theaters on April 24, 2015. After his wife leaves him for someone else, Ted spirals into depression and decides to commit suicide. First, he wants to tie up some loose ends. He moves in with his politically incorrect brother and his family. He confronts his old school teacher who made his life hell. She is suffering from dementia in a home for the elderly. Whilst confronting her he meets her granddaughter Greta. He confides his plan to her and she takes an interest. She wants to document his life leading up to suicide. He then confronts his childhood bully who it turns out is extremely sorry for the way he treated him and wants to make amends. They become friends. He sleeps with his high school crush who is married with 5 children. She leaves her family for him. He eventually tells her he doesn't want that and she is hurt. His nephew comes out to him and he starts to realise everyone is suffering problems. Greta's grandmother dies and he is supportive. He backs away from a kiss reminding her he won't be there and she is angry as he is running away. He learns her mother committed suicide which is why she has so many barriers up and was interested in his story. His nephew beats up his boyfriend out of confusion and goes to jump off a cliff. Ted and the family try to talk him down but he slips anyway. Ted and his brother jump in. Knocked out Ted reconnects with his dead father who tells him how important living is. Ted is resuscitated and goes on to stay in the town he grew up with Greta surrounded by all his family, his new and old friends. As of July 10, 2013, filming was under way in Los Angeles. The premiere took place at the 2014 Tribeca Film Festival. The film was released in select theaters on April 24, 2015 before a video on demand, digital store, DVD and Blu-ray release on May 12, 2015. Rotten Tomatoes, a review aggregator, reports that 10% of 10 surveyed critics gave the film a positive review; the average rating was 1.9/10. Metacritic rated it 24/100 based on six reviews. Justin Chang of Variety called it "a dismal, tonally disastrous small-town farce". Frank Scheck of The Hollywood Reporter described it as "a serious misfire" whose tonal shifts would be difficult for a veteran director to manage. Ethan Alter of Film Journal International wrote, "Cox must have seen something in this screenplay that encouraged her to film it, but whatever that critical element was, it’s not apparent in the finished product." Stephen Holden of The New York Times wrote that the film "lurches along a wobbly line between salacious comic nastiness and nauseating sentimentality" without properly integrating them into a cohesive whole. Joe Neumaier of the New York Daily News wrote: "Courteney Cox's misbegotten project is a comedy-drama that, to Cox's credit, doesn't feel at all like a TV sitcom. The former "Friends" star clearly wanted something special, but sadly the result is ... this." In one of the few positive reviews the film received, Gary Goldstein of the Los Angeles Times wrote, "Anchored by a nicely understated performance by Seann William Scott, Just Before I Go effectively juggles a wealth of genuine, at times profound, emotion with quite a bit of nutty-raunchy humor." ^ a b Chang, Justin (April 26, 2015). "Film Review: 'Just Before I Go'". Variety. Retrieved April 27, 2015. ^ "Just Before I Go". The Numbers. Retrieved April 27, 2015. ^ "Courteney Cox's Directing Debut Gets New Title Six Days After Announcement". Showbiz411.com. June 23, 2013. Retrieved March 17, 2014. ^ "Just Before I Go". AllMovie. ^ a b Takeda, Allison (April 27, 2014). "Courteney Cox Gushes About Boyfriend Johnny McDaid: "He Supports Me in Every Way"". Us Weekly. Retrieved April 27, 2015. ^ a b Brow, Jason (April 21, 2015). "'Friends' Reunion: Jennifer Aniston & Courteney Cox Hug On Red Carpet". Hollywood Life. Retrieved April 21, 2015. ^ "Courteney Cox's puffy face on the set of her directorial debut gets tongues wagging". DailyMail.co.uk. July 10, 2013. Retrieved July 27, 2013. 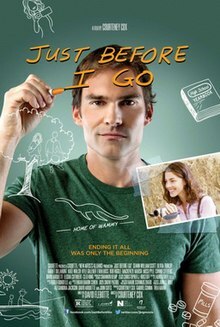 ^ "Just Before I Go (2015)". Rotten Tomatoes. Retrieved April 27, 2015. ^ "Just Before I Go". Metacritic. Retrieved April 27, 2015. ^ Scheck, Frank (April 25, 2014). "Just Before I Go: Tribeca Review". The Hollywood Reporter. Retrieved April 27, 2015. ^ Alter, Ethan (April 23, 2015). "Film Review: Just Before I Go". Film Journal International. Retrieved April 27, 2015. ^ Holden, Stephen (April 23, 2015). "Review: In Courteney Cox's 'Just Before I Go,' a Settling of Accounts". The New York Times. Retrieved April 27, 2015. ^ Neumaier, Joe (April 23, 2015). "'Just Before I Go' review: Courteney Cox's dramedy with Seann William Scott is a misfire". New York Daily News. Retrieved October 11, 2015. ^ Goldstein, Gary (April 23, 2015). "Review 'Just Before I Go' finds the journey home can be funny, useful". Los Angeles Times. Retrieved April 27, 2015.